Perfect for your conference room or auditorium, this laptop cart lets you keep your laptop and other materials at the ready. This mobile cart offers a stylish, yet functional design for use in front of clients and behind the scenes. Pullout compartment lets you store your laptop and other supplies. Cart has a 30 lb. capacity to help you store more items. 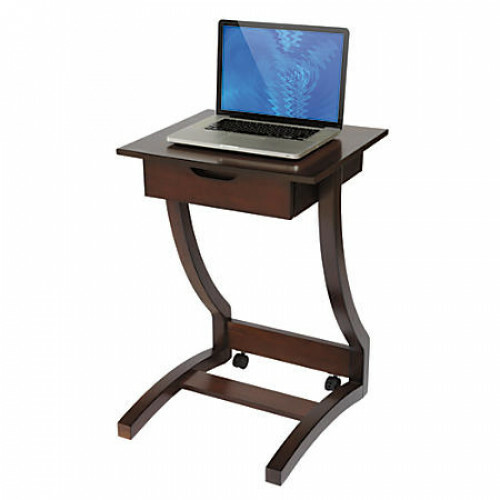 This mahogany laptop cart features solid wood construction with wood veneers for durability. 2 lockable casters for easy mobility. The minimalist style of the Mobile Steel Workstation Desk makes it ideally suited for a personal or ..
Look and feel like a tech professional when you use Home Line mobile workstation desk. With clean li..